Humboldt State University has been recognizing the achievements of alumni since 1960 when the University launched its annual Who’s Who Award. This year, we celebrate our 2019 Distinguished Alumni who have been recognized as leaders in their fields and have been outstanding contributors to their community, nation, or Humboldt State University. From left to right: Lisa William; Mike Radenbaugh and Ty Collins; and Mark Andre. Lisa William (’92, Journalism, ’96, English (Education)) is a professor at California State University, Sacramento and San Joaquin Delta College. Lisa teaches more than nine courses a semester while maintaining a very active service and publication record. Lisa has authored and co-authored nearly 25 academic journals, articles, book chapters and other publications. Each semester, she teaches popular courses on topics like Urban education, discourse on race and gender in educational settings, and social and psychological foundations of multicultural education. Lisa is committed to improving opportunities for all her students. She has served as a mentor in the CSUS Pathways Fellows program, advisor for the CSUS McNair Scholars, and co-advisor for the CSUS Graduate Education Student Association. Lisa is the 2018-2019 recipient of the CSUS College of Education Outstanding Teaching Award, the 2012 UC Davis Distinguished Alumni Award, the 2006 International Society for Exploring Teaching and Learning Distinguished Fellows Presentation Award, and the 1999 Sacramento City Unified School District Teacher of the Month. 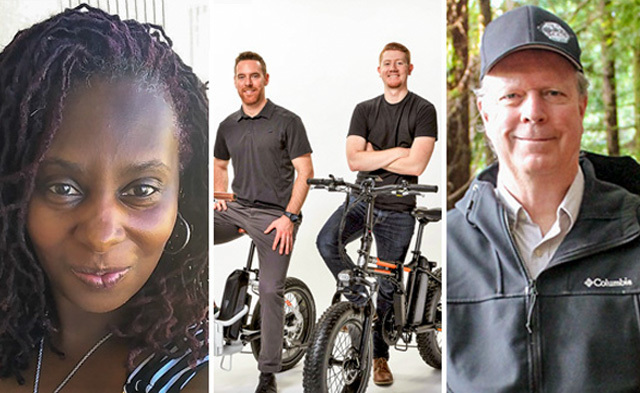 Mike Radenbaugh (’12, Industrial Technology) and Ty Collins (’10, Journalism) are the co-founders of Rad Power Bikes, North America’s largest electric bike company. They make electric bikes that are accessible, affordable, and appealing to the masses, and continue to pioneer the world of sustainable transportation. Rad Power Bikes intentionally forgoes the traditional bicycle distribution channel of third-party dealers and retailers, enabling them to provide customers with premium ebikes for almost half the cost of comparable models, while building a closer relationship with the rider. Mike built his first ebike in 2007 as a way to get to school without breaking a sweat. His “frankenbikes” quickly caught the attention of his small town, and he started building ebikes for friends, family, and neighbors. Today Mike and Ty employ a team of nearly 100 with headquarters in Seattle, Washington, Vancouver, British Columbia and Utrecht, Netherlands. Mike and Ty have been named to Forbes and Inc. Magazine’s “30 Under 30” lists, and Seattle’s Puget Sound Business Journal’s “40 Under 40” list. Mark Andre (’79, Natural Resources Planning & Interpretation) is the Director of Environmental Services for the City of Arcata and a registered Professional Forester. In this role, Mark overseas Arcata’s environmental programs, natural resources, parks and recreation, community forest, wildlife areas, and public utilities. Mark manages an annual budget of $19 million and a staff of 40 full-time and 50 part-time employees. Because of Mark’s efforts the Arcata Community Forest, established in 1955, has grown considerably. He has worked closely with Humboldt State to allow use of the forest not just for field trips but also for research by faculty and students. The forest is nationally considered as a model community forest. Mark recently helped lead the acquisition of 967 acres of public forest in the Jacoby Creek watershed, of which 884 acres will be given to HSU. Mark worked to secure a $1.7 million donation from the property owner (R.H. Emmerson & Son) and grant funds from several sources, including $1.75 million from the California Department of Fish and Wildlife, $800,000 from CAL FIRE Climate Investment Fund, $230,000 from the California Resources Agency, $1.72 million from the Wildlife Conservation Board, and $45,000 from the US Fish and Wildlife Service. Mark was appointed to the California Board of Forestry by Governor Arnold Schwarzenegger in 2010 and reappointed to additional terms by Governor Edmund G. Brown Jr. He was recently recognized by the California State Assembly with a resolution recognizing his nine years of service to the Board including his work on the State Forest Carbon Plan and leadership working on forest practices regulations.